I've looked extensively on this forum and the website. Do instructions exist for building the openMV firmware from source? I see the Makefiles in the /src directory on the open-mv github account but is there a document that outlines the build process and/or requirements and any general documentation regarding the device firmware? Thanks, *slaps forehead*. I did not look at the wiki page (should have looked there). Makefile:5: *** Invalid BOARD specified. Stop. 18:50:51: The process "/usr/bin/make" exited with code 2. It appears I'm not specifying the right board but from what I can tell the TARGET=OPENMV3 variable should be taking care of this. Also FYI I've tried this on both master and the 3.0 tag. I figured out what the issue is. I forked the openmv/micropython repo and checked it out manually instead of using the --recursive function when cloning the openmv repo. By doing this, the repo was set to the master branch not the openmv branch which means the OPENMV boards weren't present in the ports/stm32/boards directory. Once I did a checkout of the openmv branch the project built just fine. This might be a good note to add to the wiki for people forking their own copies of the micropython repo. I'd be happy to suggest an edit if you would like me to. Mmm, I see. I think the recursive flag is in the build docs. Um, sure. Just edit the MD file and send a copy. Not sure if you can PR wiki pages. Exactly, the --recursive flag pulls the proper openmv commit which right now is fc69b6a (aka head of the openmv branch). If you fork your own version of openmv and micropython then you need to do a git checkout openmv to switch to the branch which has the right board files. May I suggest an improvement in the Firmware Update dialogue for next time? I interpreted the existing message that the blue LED indicates it is complete with the update. While it flashed blue, it was apparently RED when complete. So, I stared at it for a while as instructed. I think, if the RED LED is the indicator that the update is successful, the dialogue/message should reflect that. The red LED means the OS is accessing the file system. The blue LED is the script running the heart beat. You should just need to see the blue LED. I dont have any idea what "recursive" means etc. etc. I also havent tried compiling as per the procedure in the wiki yet, will try it later. 1. How do you go on developing the openmv firmware? How those file (from git) are imported into the IDE as project files? 2. what are the changes needed be? Do I use Cubemx for the setup files and pinout definitions (for that "init" purpose only https://www.kickstarter.com/projects/17 ... MTY3NzQ%3D)? Because I have this impression that the STCube is only to init ports and freq among others. 3. Since I see that STCube, SW4STM32, mbed and Atollic are free, why not use those as IDE? I may be wrong on STCube as being IDE because I havent tried it. Those are all a matter of personal preference, for example I use the command line (vim, make etc.. old school :/) Kwabena uses Eclipse I think. You can use whatever tool/framework/IDE/board you like, you can even build the code on PC, however you do need to know what you're doing as I doubt you'll find someone here with enough time to go through all that with you. Would an introductory book about all that be helpful ? Hello from wiki https://github.com/openmv/openmv/wiki#q ... stallation, it seems that the IDE used is QT Creator? Can you confirm that and I would try to install and use it too? Hi, if you are trying to build the firmware it is expected you know what you are doing. In Step 8 Under make arguments add TARGET=OPENMV3 to build for the OpenMV Cam M7 (or TARGET=OPENMV2 to build for the OpenMV Cam M4). If you don't add this the firmware is built for the OpenMV Cam M4 by default. I used TARGET=OPENMV4 for H7 in both Build Step and Clean Step. 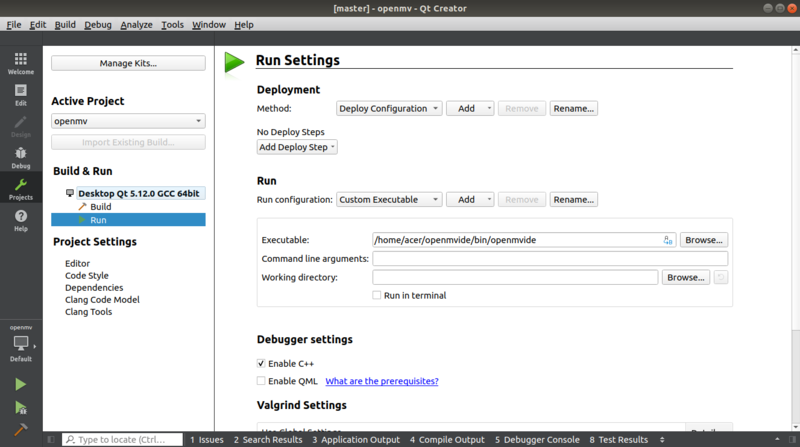 In step 9 Then switch over to the Run Tab (top area) and go to the Run configuration area on the same page. Add a Custom Executable option. 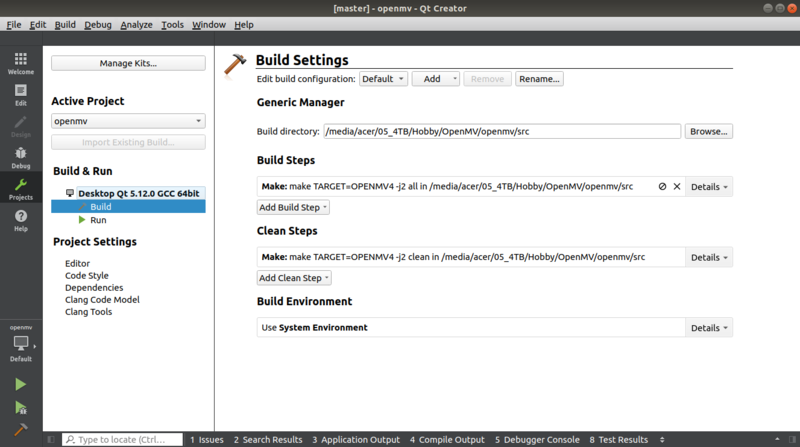 For the executable write /home/(username)/openmvide/bin/openmvide if you installed OpenMV IDE to the default location. This will allow you to launch OpenMV IDE from Qt-Creator which has the boot loader we'll use to program your OpenMV Cam. It says "(top area)" which is confusing. Could be version different, thus different layout? Anyway, seems to build, I think. Files in openmv/firmware/OPENMV4/ seems to be the current time and date.